Leaves are the showpiece of autumn, the colorful star performer that brings hordes of sightseers to view the bright last hurrah of—and goodbye to—warm weather. While it’s an annual thing, here’s one way to set this autumn’s show apart from all others: Take a kid to see the changing of the leaves. Be the knowledgeable expert who explains the science behind the vibrant colors. Choose an easy trail that anyone can navigate, or even make it a roadside attraction that can be seen from inside a car. It’s a great family outing if you have your own offspring. If not, borrow a friend’s kid. You may have viewed the annual show at a distance for decades, but seeing it close up through the wonder of a child’s eyes will increase your own appreciation, making a lasting memory that sets this year apart. 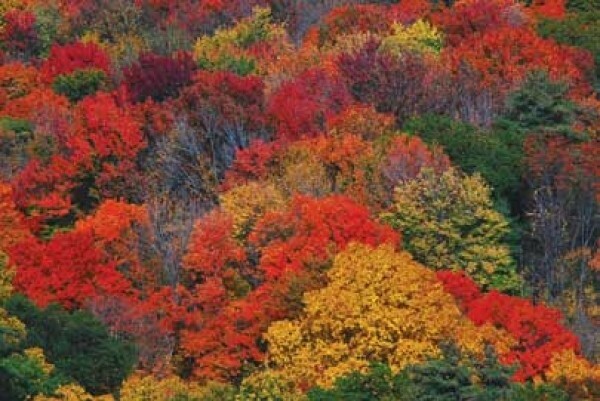 Polly Popola, natural resource recreation manager at the Salt Lake Ranger District, says Wasatch Front residents are lucky because Northern Utah’s native trees have the best colors in the state. “The brightest trees are canyon maple, aspens and Gambel oak,” she says. “The bright red is usually maple.” Aspens are the bright-gold splotches of color. Little Cottonwood Canyon also puts on a good show; everyone can “ooh” and “aah” on the drive up. At the top, there are a variety of easy trails through the Albion Basin area, with occasional trickling streams that add sound to the viewing experience. Popola welcomes calls from people wanting more information at 801-733-2686, or you can call the Forest Service at 801-999-2103. Outside the Salt Lake Ranger District, Ogden is touting its autumn leaves in the top northern part of Utah as a tourist attraction. The Ogden Valley Business Association even started a blog with details about the most scenic spots (Leaf-Peeper.blogspot.com). The blog also includes news of a fall photography workshop scheduled for Sept. 21-23, taught by well-known photographer Adam Barker. Since a little knowledge can also be a good thing, here’s an explanation of why leaves change color in fall: The life process by which trees and plants turn carbon dioxide and water into oxygen and glucose (sugar) is photosynthesis. This is done with the help of both sunlight and chlorophyll, a natural chemical that gives leaves their green color. As fall approaches, the hours of sunlight diminish, which acts as a signal for trees to stop making and storing food. Their ability to absorb water also lessens. The lowering of sun and water essentially stops photosynthesis, so the tree leaves no longer need chlorophyll. As the green color gradually fades away, only the underlying colors in the leaves are left. Many of these colors are in tree leaves at all times, but are covered up by the green of chlorophyll during the food-production time of photosynthesis. Cooling temperatures intensifies the colors. But as the days pass, so does the brightness of the colors. Waste products from summer’s photosynthesis are trapped in the leaves, which turns them brown before they fall. The tree twigs then turn dark, and (hopefully) the ground turns white, covering the leaves and providing a surface to slide on. Tell all this to a kid, and you’ll feel like an autumn expert. For additional information, visit the Forest Service’s website, FS.USDA.gov/UWCNF, or UtahFallColors.com.